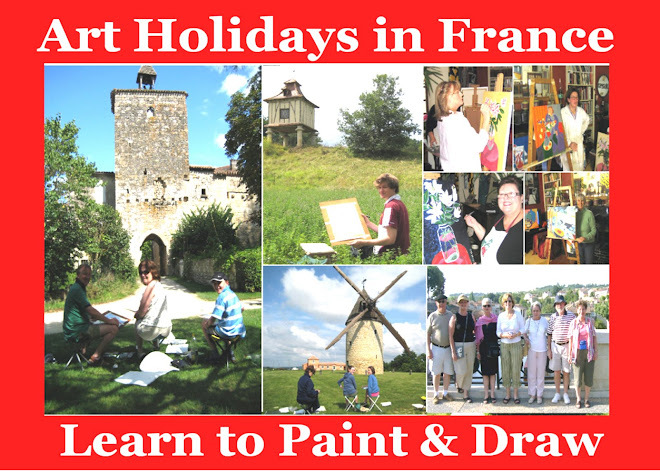 Here's the kind of thing we get up to on a painting holiday in SW France. Painting the beautiful 900 year old Abbaye de Flaran. Elizabeth showing true dedication with a few last minute finishing touches. Time for a picnic lunch en plein air at the Chateau de Cassaigne. John always gets involved recording the daily schedule on the trip. When we're not having breakfast, lunch or dinner, there's always time for a visit to the chocolate factory in Nerac. Suzanne and Jan at the Fources Flower Show. Finally, on our last day, here we are at La Petite Galerie with our best paintings of the week. Look what we painted today. ... or seeing the wonderful sights in SW France. Here we are at the Chateau de Beynac, near Sarlat de Caneda in the Dordogne. Well, y'all, here we all are having our first picnic on the banks of the Baise River at Lavardac. On the romanesque bridge leading to Henry IV's medieval mill at Barbaste. A watercolour view of the rooftops at Nerac. Watch this space for more postings.